Base32 decodes data using DUDE encoding. Converts data from base32 using DUDE encoding. The default code is based on Differential Unicode Domain Encoding (DUDE) (draft-ietf-idn-dude-02.txt). Definition at line 62 of file base32.h. 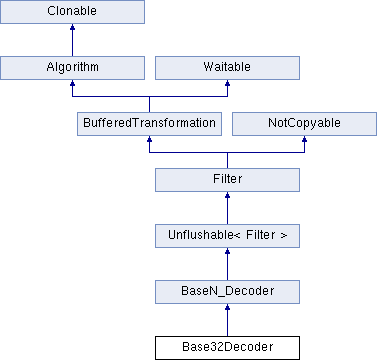 IsolatedInitialize() for an example of modifying a Base32Decoder after construction. Definition at line 68 of file base32.h. Definition at line 63 of file base32.cpp.